A former high-ranking official with the Cancer Prevention and Research Institute of Texas was found not guilty Tuesday by a 12-member jury in Austin. He had been accused of deceiving colleagues in order to secure an $11 million grant for a biotechnology firm. 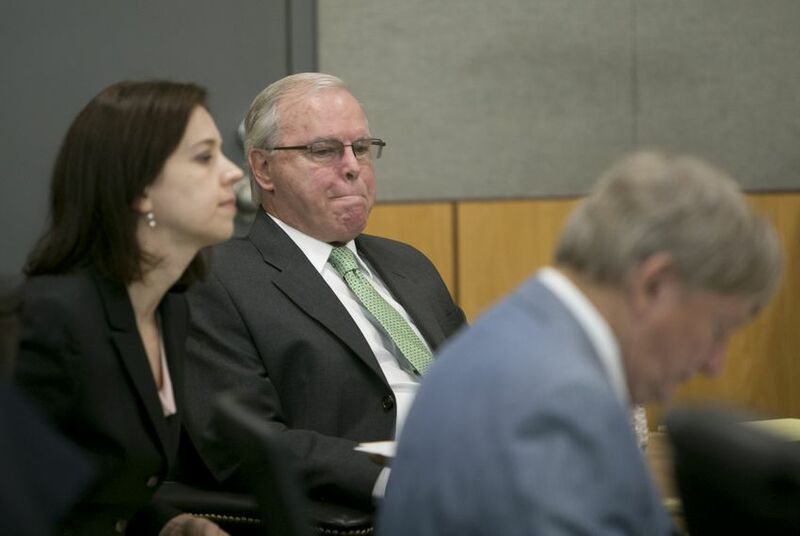 A former high-ranking official with the Cancer Prevention and Research Institute of Texas — accused of deceiving colleagues to secure an $11 million grant for a biotechnology firm — was found not guilty Tuesday by a 12-member jury in Austin. Jerry Cobbs, former chief commercialization officer of the state agency known as CPRIT — a voter-approved initiative to spend up to $3 billion on cancer-fighting projects over 10 years — was found not to have deliberately misled his colleagues to get the grant approved, as argued by the state's Public Integrity Unit, which investigates public corruption. The case centered on whether Cobbs misled CPRIT officials in 2010 to believe that the grant to Peloton Therapeutics, then known as Damascus Pharmaceuticals, had undergone a required business or scientific review. After Judge Clifford Brown announced that Cobbs had been acquitted of the first-degree felony charge, Cobbs told reporters he was grateful to be vindicated in the public eye. "We’re just very pleased that folks who don’t know me at all agree with the assessment we’ve had all along, which I didn’t do anything wrong, not at all," he said. "Throughout this entire three-year period, with this criminal indictment — serious, serious criminal indictment hanging over my head — I couldn’t even do a volunteer job at the Houston Museum of Natural Sciences." Cobbs, who opted not to testify, last week pleaded not guilty to the charge that he unlawfully withheld information to secure the grant to the Dallas-based biotechnology firm. His acquittal marked the latest blow to the state's Public Integrity Unit, which had its funding slashed in 2013 by then-Gov. Rick Perry. Both sides made their final case to an Austin jury Tuesday morning in a stuffy courtroom, with lawyers intermittently complaining about the air conditioning. In closing remarks to the jury, Jenny Brevorka, a Houston attorney representing Cobbs, said she was having trouble sleeping and eating because she was worried about her client’s fate. Brevorka and fellow defense attorney Rusty Hardin sought to portray Cobbs as an honest, hardworking man who had been vilified by his former CPRIT colleagues and the news media. They said he was made the scapegoat for an entire agency that had faltered in its ambitious bid to cure cancer. Though Cobbs had failed to make sure the Damascus grant underwent proper peer review before it was signed by the agency's executive director, they said Cobbs' motives were pure and he never deceived his colleagues. “The intent was to get life-saving products to the citizens of Texas,” Brevorka said. Travis County prosecutors offered a different motive — though they stressed intentions were irrelevant to the letter of the law in this case. Prosecutor Gregg Cox said Cobbs was “falling behind” his colleagues and therefore sought to fast track the $11 million grant. The other two chiefs at the cancer-fighting agency, who oversaw funding for scientific research and prevention initiatives, had gotten dozens more proposals approved than Cobbs, Cox said. “I think you can make a reasonable inference from the evidence that he was worried about what might happen to his job if he didn’t get some grants pushed out the door to keep up with his counterparts,” he said. Cobbs earned an annual salary of $175,000 as the cancer-fighting agency’s chief commercialization officer. That made him a “well-paid state employee who is a professional and should be trusted to do his job, and do it correctly — and more importantly, do it honestly,” Cox said. “It’s not right to look for the last man standing and blame him,” he said. And while Cobbs failed to tell his superiors at CPRIT that the Damascus grant had not received adequate peer review, his colleagues were remiss in not asking about it, Hardin said.